Of it little post-war development of HMGs. However, the USSR produced a revised version of the 12.7mm gun, the DShK-38/46, with an improved ammunition feed, using belts which could be linked together, and a quick-change barrel (something the Browning M2 still lacks). They also produced a brand-new weapon, the formidable 14.5mm KPV, the king of the HMGs. This is based around the powerful 14.5 X 114 AT rifle cartridge and uses recoil operation with gas assistance provided by a muzzle booster. The KPV has had two major applications: as an A A weapon on towed mountings known as ZPU-1, -2 or -4 depending on the number of guns fitted and as an armoured vehicle gun, typically mounted in turrets in various light AFVs. ZPU stands for Zenitnaya Pulemet Ustanovka, or A A machine gun system. ZPU-2 mountings were also fitted to light SPAAGs such as the BTR40B 4X4 and the BTR152A 6X6. The high muzzle velocity of up to 1,000 m/s coupled with a heavy projectile gives a performance in a different league from that of other HMGs. It has an effective ceiling of 1,400m, a horizontal range of 8,000m and the AP shot can penetrate 32mm of armour at 500m. 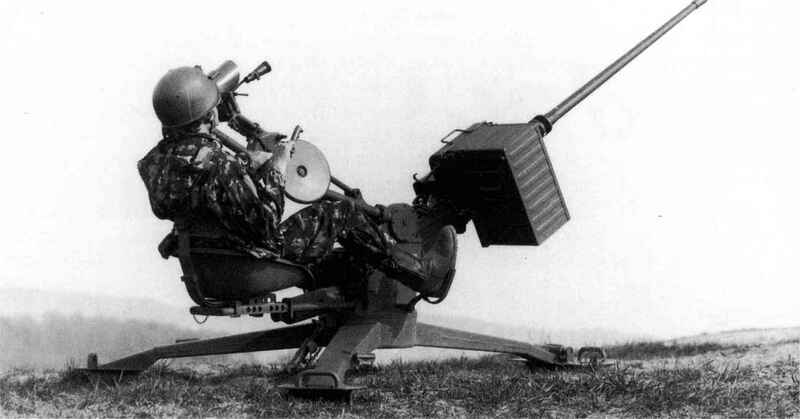 Poland has developed a ground-support version, the KPWT Pirat, on a recoil-absorbing tripod of considerable weight. rotary-bolt design. The gun, which only weighs 25kg, is available for infantry use on a tripod but is most often seen fitted on a pintle mounting on battle tanks. In this guise, known as the NSV-T, it can be operated from within the turret. The Chinese have produced their own versions of many of the Soviet guns, including the 12.7mm DShK-38/46 (known as the Type 54) and the 14.5mm ZPU-1, -2 and -4 (Types 75 and 80, 58 and 56 respectively). They have also designed their own HMGs around the 12.7 X 108 round. The first, the Type 77, is claimed to weigh only 56kg including its tripod. An even lighter weapon at 39kg all-in (18.5kg gun only) is the Type W-85 in the same calibre. These guns are available with tripods and sights to facilitate AA use if required. Despite the continuation of the .50" Browning M2 in American and other service, many attempts have been made to produce a more modern weapon using the same ammunition. Some, by firms such as FN, RAMO and SACO, have mainly consisted of updating the basic M2 by improving the somewhat convoluted method of barrel changing and, in later SACO/RAMO versions, by reducing the barrel length and weight. Another weapon which saw service in AFVs was the M85, which had the advantage of a much shorter receiver and two rates of fire but was regarded as less than successful. Still others have been more radical, such as the prolonged American attempt to produce a brand-new GPHMG (general-purpose heavy machine gun). The American GPHMG project resulted in a viable weapon, nicknamed 'Dover DeviP. It was a gas-operated, modular design with a quick-change barrel and dual feed, and weighed considerably less than an M2. The project was cancelled due to lack of funds, but a very similar weapon has been put into production by Chartered Industries of Singapore as the 50MG. This does not mean that American HMGs begin and end with the M2 and M85. Another quite different weapon using the 12.7 X 99 cartridge is the General Dynamics GAU-19/A, an externally powered three-barrel rotary gun capable of up to 2,000 rpm. It is primarily designed for helicopter mounting, in order to provide a high volume of suppressive fire against enemy troops, but can also be fitted to land vehicles. The Madsen company, in the form of Madsen-Saetter, produced a final flurry of new offerings in the late 1950s, including an HMG chambered for the 12.7x99 cartridge, but this saw little or no use. A different attempt to produce a new Western HMG was the Belgian FN BRG-15, intended for AFV use. This was originally developed in the 1980s around a 15 X 115 cartridge based on the 20mm HS 404/804 case (which was therefore almost identical to the old 15mm Besa cartridge except for its extra length), but later versions used a 15.5 X 106 case which was essentially a 'necked-out* 14.5mm KPV round. The gun delivered a formidable AP performance, even better than the KPVs, but did not achieve commercial success. While the emphasis has so far been on new guns and cartridges, the usefulness of HMGs has also been extended by less obvious developments in ammunition and mountings. In the latter case, new recoil-absorbing mountings have enabled far more accurate long-range fire as the gun is no longer shaken off aim by recoil. Ammunition developments have proceeded in two different directions: more effective shells, and APDS rounds. HMG ammunition has generally been considered too small for an effective HE shell, but modern developments have altered this. In particular, the Norwegian firm Raufoss has developed a range of multi-purpose ammunition which combines a chemical impact fuze with HE and incendiary elements as well as a useful armour-piercing performance. In .50" calibre this round is known as the NM140, and this APHEI projectile is claimed to be as effective as earlier generations of 20mm ammunition. turret mountings for APCs, no doubt prompted by the current emphasis on low-intensity peacekeeping. The Denel LCT-12.7, introduced in 1999, is the latest example.